On Saturday night, after The Great New Zealand Crime Debate event at the Christchurch Writers Festival, we will find out who takes home the terrific hand-crafted art trophy designed and created by local sculptor Gina Ferguson (along with the winner's cheque - thanks to the Christchurch Writers Festival Trust - and collection of Ngaio Marsh novels - thanks to HarperCollins, Dame Ngaio's publisher). Before then, I thought it might be fun to take a closer look at each of the contenders - four days left, four books and authors. Kicking things off, alphabetically, in the red and black corner (Canterbury colours) we have COLLECTING COOPER by Christchurch crime writer Paul Cleave, who won the 2011 Ngaio Marsh Award for BLOOD MEN, and is one of the most successful contemporary New Zealand writers of any kind on the global stage. COLLECTING COOPER, Cleave's fifth dark thriller, sees the return of former cop turned private eye Theo Tate (from CEMETERY LAKE), who is released from prison after serving a sentence for drunk driving. It is the first time Cleave has brought back any of his protagonists in a leading role (each of his first four thrillers had different main characters, even if supporting characters overlapped). People are disappearing in Christchurch. Cooper Riley, a psychology professor, doesn’t make it to work one day. Emma Green, one of his students, doesn’t make it home. When ex-cop Theodore Tate is released from a four-month prison stint, he’s asked by Green’s father to help find Emma. After all, Tate was in jail for nearly killing her in a DUI accident the year before, so he owes him. Big time. What neither of them knows is that a former mental patient is holding people prisoner as part of his growing collection of serial killer souvenirs. Now he has acquired the ultimate collector’s item—an actual killer. Meanwhile, clues keep pulling Tate back to Grover Hills, the mental institution that closed down three years ago. Very bad things happened there. Those who managed to survive would prefer keeping their memories buried. Tate has no choice but to unearth Grover Hills’ dark past if there is any chance of finding Emma Green and Cooper Riley alive. For fans of Dennis Lehane’s Shutter Island, Thomas Harris’ Silence of the Lambs, and Jeff Lindsay’s Dexter series, Collecting Cooper is another “relentlessly gripping, deliciously twisted, and shot through with a vein of humor that’s as dark as hell” (Mark Billingham) novel by this glimmering new talent in the crime thriller genre. You can read an extract from COLLECTING COOPER (the first few pages) here. The Ngaio Marsh Award judging panel, consisting of seven crime fiction experts from the United Kingdom, Germany, the United States, and New Zealand, was likewise impressed by COLLECTING COOPER's mixture of brutality and brilliance, putting it through to the finals from a tough and closely-contested long-list for the 2012 Ngaio Marsh Award. Amongst other comments, the international judging panel praised COLLECTING COOPER as "dark and poetic" and filled with "great characters and a great sense of place". But will this be enough for Cleave to secure back-to-back Ngaio Marsh Awards? Will the hometown boy once again take the trophy depicting his fellow Cantabrian? He's facing some pretty stiff competition again this year, from Cross, Sanders, and Symon - all of whom have written very good crime thrillers too. Tomorrow I'll take a look at another of the contenders for the 2012 Ngaio Marsh Award. 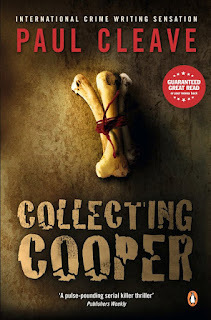 But in the meantime, have you read COLLECTING COOPER? If not, does it sound like the kind of crime thriller you might like to try? Or would it be too dark for you? Thoughts and comments most welcome.